Can Thursday night television get any BETTER?! With 'Ugly Betty' hitting its stride and tugging on the heart strings, and 'The Office' getting zanier & sillier (did you catch the ep post-Super Bowl? One of the best *ever*), Thursday eve is once again the best night to hunker down for a night's worth of good TV viewing. Tina Fey's '30 Rock', the critics' latest darling, lives up to their over-wrought platitudes, grasping hold of its place as the jewel in the crown of TV choices. Just when it seems improbable that it can get - any - better... it does! 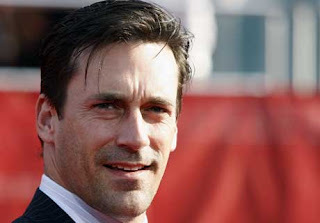 Fey's 'Liz Lemon' has a new love interest, Don Draper himself, Jon Hamm! Last week was his first guest spot on the series, and he's back again tonight. All floppy haired and bespectacled, Hamm personifies Liz Lemon's dream man and here's where the hilarity resides. Follow the lead of the cool kids. Drop the deadly bore that is 'Grey's Anatomy' (yep, I finally cut the cord), and laugh your self silly through Thursday nights instead. Okay, yeah...'Grey's' has been truly ridiculous and laugh out loud funny -- unintentionally, mind you -- as of late but stick with the Emmy Award winners of 'Ugly Betty', 'The Office' and '30 Rock' to tickle your funny bone properly. Oh I MUST find this and watch it. Not a fan of 30 Rock, but my love for Don Draper conquers all!